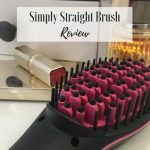 The blow dryer brush is fairly new to the hairstyling market and I love a new product so when I first heard about them I had to try out a few to see if they really do what they say they do. I am a styling product addict and I have tried my fair share of hair straighteners, curling brushes, curling wands and hair dryers so I am used to trying out new hair gadgets. I also look for convenience and reasonably priced products because maintaining my hair is important to me but I don’t want to spend lots of money on equipment, I’d rather find good quality attractively priced hair tools. 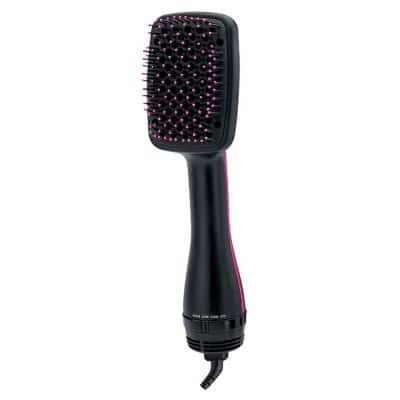 There are quite a few different blow dryer brush models available now. If you’re unsure what they do, it’s very easy, they look like a brush (paddle, curling, comb etc.) and blow hot air through them while they style. Effectively they are built-in hair dryers so you don’t have to use a hair dryer and a brush – you just use one hair appliance. This is great because it frees up your other hand and I think speeds up the process. These blow dryer brush styling tools are great for all hair types. My hair is shoulder length and medium thickness, it does have a curl to it and sometimes I like to wear it curly, sometimes I like to straighten it out. Blow dryer brush tools are capable of doing both although it depends on which model you choose. I love Revlon, it’s a trusted brand with longevity and it’s been around since long before I was born! Revlon specialise in hair and beauty so I purchased this product because it has positive customer reviews on Amazon. I thought this was a reasonably priced too. The reviews are very good. The brush looks like a paddle brush and you simply brush as you dry. Switch it on and off you go! Beware it’s quite noisy but I promise, it works. To get right to the back I would suggest sectioning out hair so you don’t get “kinks” underneath. If I use a regular hairdryer it takes me half an hour to blow-dry my hair. With this, it took less than 20 minutes. That’s a great time-saving! For big waves or big volume the Babyliss Pro Nano is terrific! It’s a similar price to the Revlon and gives a different finish. It retails at a discount on Amazon.com and looks like a large curling brush. Switch it on and it blows hot air so you can style as you dry – fantastic! 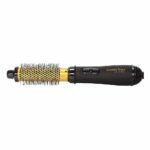 The barrel rotates as you use it and this takes a little getting used to but the rotating action blows so much air into the hair it really lifts from the root and gives amazing volume. It’s relatively heavy but worth the weight. It also has three temperature settings so if you’ve got fine hair, use the lowest. I would say this is great for volume but don’t expect small curls, the brush is fairly large so not built to achieve huge waves. Now if you’re on a budget this air styler creates curls with volume. It’s really popular with very high reviews. If you want bounce and curls this is superb and I would recommend it for all hair types. It has two speed settings as well, so if you want to style in a hurry use the faster of the two. I can dry my hair with waves in 20 minutes. There are also two heat settings so if you have fine hair use the lowest. You can unscrew the brush so you can wash it when it needs it which I think is a great advantage. Use it on wet hair and expect superb results every time! This is definitely my budget favorite. 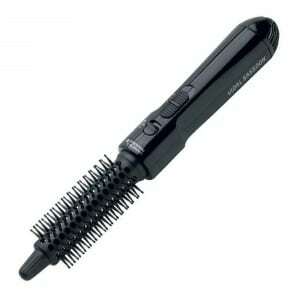 This is a comb hot air styler and it’s best for straightening so if you want curls don’t buy this product. I like this because it gets right through the hair rather than just styling the top layer, and, like the others, you can use it straight from wet. From what I can see it works well for even the thickest type of hair (mine is medium thickness) and it works very quickly. It has the ionic technology so it smooths and shines removing frizz and there is a cool shot button (I love this!) so really sets hair. If I want to straighten my hair, out of the four products I’ve reviewed here, this is the best. It’s also small but chunky and because it’s not a big product I can take it out with me so if I’m not coming home to get ready for a night out – it’s perfect for a medium size handbag. So for curls get the Vidal Sassoon Tangle Free Hot Air Styler and for sleek straight looks, I would recommend the Infiniti Pro Conair Wet/Dry Hot Air Styler. 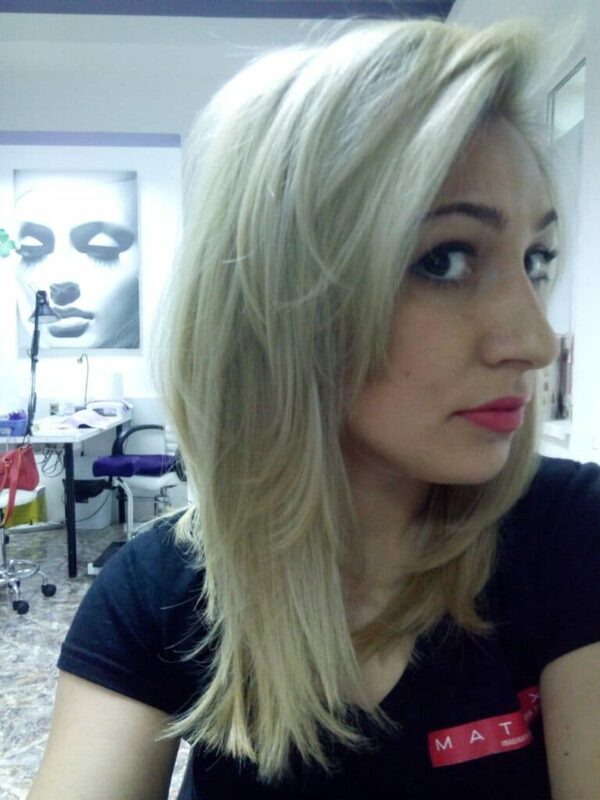 What is the name of the hot air brush you are using on your hair in the pictures? ( the grey and purple one with ‘ceramic’ written in it! 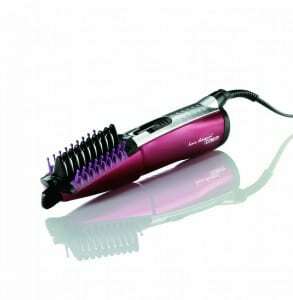 It’s an older model of Babyliss Rotating Hot air brush, you can find the newest version HERE. 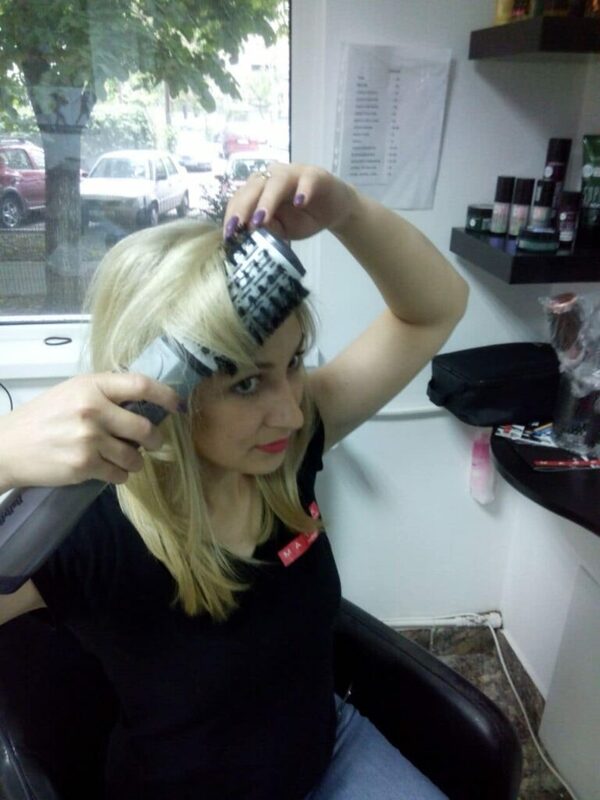 The main differentiators vs other models: it has a metal barrel while Conair has a plastic one, in general the materials used are of higher quality and durability, since it is intended for professional salon use. This also explains the higher price point (almost double) vs Conair. You may take a look at our updated Hot air brush guide for additional info.